As you’d expect from a bona fide Crazy Tea Chick, I always have at least one glass of iced tea going at all times. The Iced Tea Glass is Always Tall. 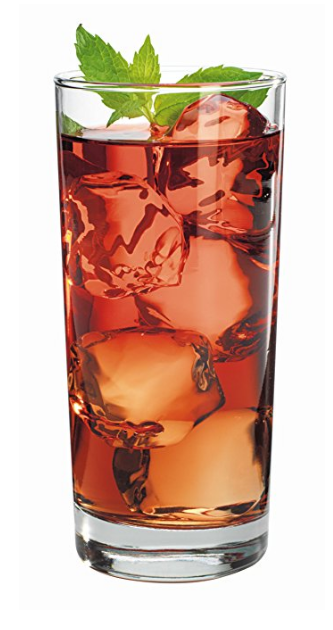 In fact, if we’re being totally honest, Spring and Summer usually find me with two glasses of iced tea – one black or green and one raspberry….. both tall. The Anchor Hocking 15 oz Glasses, pictured here, are some of my favorites. They’re sturdy, thick (so the ice stays ice without pulling a disappearing act, even if I’m outside), and… you guessed it… tall. These made in the USA beauties (sold in a set of 12) are available on Amazon. They’re also available in other sizes if you don’t happen to drink as much as me! As I’ve mentioned before on this very tea blog, I am nothing if not obsessed with beautiful dishes. Plates, bowls, saucers, mugs, glasses – the works. When I see beautiful glasses or other dishes, they just strike me as works of art. The gorgeous Bormioli Rocco Murano 14-7/8-Ounce Cobalt Blue Beverage Glass, Set of 4 above is a PERFECT example. Who wouldn’t think “work of art” when they see these beauties? Naturally, since Sweet Iced Tea is my life, I see these beauties as IDEAL for iced tea – but let’s be honest, they’d be IDEAL for just about anything, from juice to milk and water to iced coffee. Click through the link or picture for a closer look. Can you imagine how beautiful they’d be on a holiday table?!? !